When my kids were little, little enough to have been impressed by food that looked somethings else, I was just plain too tired to be creative. Isn’t that always the way? Kind of like when you come up with the perfect response to someone an hour after you needed it? I have loved being a parent at every age and stage, each requiring a different skill set and an ever changing ability to think fast. But man it’s hard work too, all of it. To all of you parents of littles and not so littles, just barely holding on because you are so exhausted from bringing your best game to the table every single day for what feels like forever with sometimes little or no thanks: keep going, you’re doing great, they’ll thank-you one day, this too shall pass. So all that to say, I needed dinner on the fly the other day. Ingredients were sparse, I didn’t feel like cooking, and just, whatever. I had a tub of Bocconcini in the fridge, some spaghetti, opened jars of pizza sauce, pasta sauce, and pesto. A random Google of the ingredients for recipe ideas and voila! Maybe not the sexiest looking thing you’ve ever seen, but I got an A for creativity from the family and gave myself an A using up some leftovers from the fridge and making shelf space. 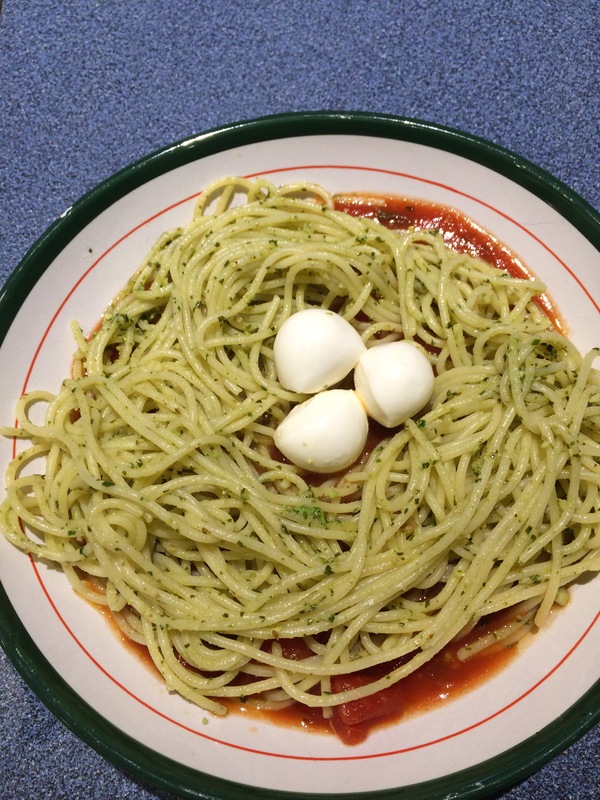 My son still won’t eat Bocconcini, but I tried. His loss because they are delicious.